Using the observed 2007/2008 September sea ice extents as a starting point, we predict an expected value for a nearly sea ice free Arctic in September by the year 2037. The first quartile of the distribution for the timing of September sea ice loss will be reached by 2028. The analysis was done using the 6 IPCC models which were most accurate in simulating currently observed sea ice conditions. Having already gone platinum, the WaPo's poster boy for journalistic lack of integrity, George Will, today repeats one of the lies he was already called on from his previous assault on climate science. What is he aiming for now, titanium? Perhaps he's shooting for the Black Card (as in carbon fiber). The only other full-page ads in the A section are from Shoppers grocery and Macy's. ClimateProgress says, "The Washington Post, abandoning any journalistic standards, lets George Will publish a third time global warming lies debunked on its own pages." If you want an explanation, just follow the money, as Woodward and Bernstein did when they were committing acts of real journalism. As noted over the weekend, recent rains just barely prevented a February-March dryness record from being set in Washington, but the developing drought has barely been dented. 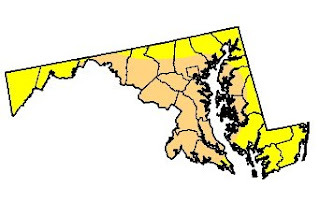 The latest weekly Drought Monitor, issued today, shows a slight decrease of Moderate Drought from 32% to 27% in Virginia. Maryland, however, remains at 52%. With the 0.18" of rain which started off April yesterday, the year-to-date total of 5.18" at National Airport is only 54% of average. At this point, more than 2.27" of precipitation will need to fall the rest of April in order to avoid breaking the record low February-April total of 4.77" set in 1947. Average precipitation for April is 2.77".
. . . after listening to the compelling arguments of the distinguished speakers who participated in the Heartland Institute's recent global warming contrarian conference, we have decided that the science is settled — in favor of the contrarians. Several commenters at the blog declared their relief that they can now relax and devote their full attention to disproving evolution, bioengineering magic Dyson trees, and overturning the tyranny of the law of gravity. Disclaimer: The Climate Capitalist unfortunately still owns stock in Time Warner, parent company of CNN. As RealClimate reported last week with all due respect, the Cato Institute was soliciting signatures for an ad bashing President Obama's climate change position. Recipients of the WaPo's carbon-based product found on their doorsteps this morning that the ad constituted one third of the newspaper's incredibly shrinking business section. He keeps the details of his methodology for making predictions a secret, and has been criticized for making unfounded claims about the power of his predictions, even after they turned out to be inaccurate. Today AccuWeather came out with their forecast 2 weeks ahead of the Dr. Gray update due on April 1st. They(AccuWeather) say the higher chances should be up the east coast (they said that last year too) rather than into the Gulf. But their forecast is worded such that they can't be wrong no matter what happens. Is there any value here? None that I see as we must prepare for the worst as always. Yep, more computer model forecasts for 2100, this time regarding sea level rises. No it didn't focus on us, but this time centered more on New York City & New England. Gosh, if only the models would give us a 5-10 year forecast so we could verify their skill. But noooo...it's always 50, 70, 100 years from now. I guess if they didn't scare us, they wouldn't be able to get more government funding? DotEarth has a post on the subject here.